A little bit of cargo bike deliciousness from a Nordic neighbour in Helsinki. 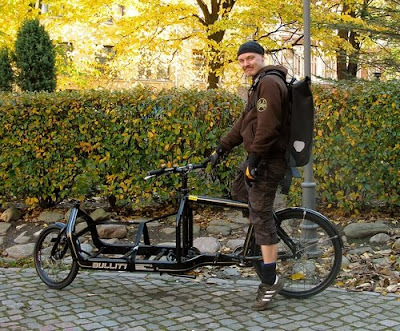 Tuomo runs a bike messenger company in the Finnish capital and he is pictured above on his new Bullit cargo bike from Larry vs. Harry. I'm a bike messenger who started a tiny cargo bike messenger operation last year here in Helsinki, Finland. Our idea is to demonstrate the functionality and environmental benefits of cargo bikes - not just to make profit. Helsinki is quite bike hostile city, winters are crap and planning for bike lanes etc. is erratic at best - but we try to make a difference. I´ve been reading your blog for some time now - and really, really like the way you do things over in Copenhagen. I just bought a modern Bullit-type cargo bike from Larry vs. Harry - our other bikes are of Dutch/German Filibus-type. Great to hear from Helsinki, Tuomo. Thanks for sending us the photo. There is a boom in European bike messengers choosing two-wheeled cargo bikes at the moment, especially the Bullitt from Larry vs. Harry. Not only here in Copenhagen, but in Berlin, Paris and other cities. There are already messengers on three wheels in Copenhagen but the two-wheeled movement is growing and Larry vs. Harry is leading the way since their inaugural appearence at the Eurobike Bike Fair a couple of months ago. 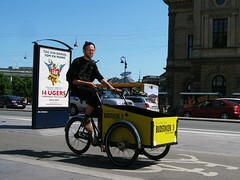 Rumour has it that there will be a cargo bike category at the next bike messenger world championships in Berlin. Coooool. Article from the New York Times on bike messengers on cargo bikes.